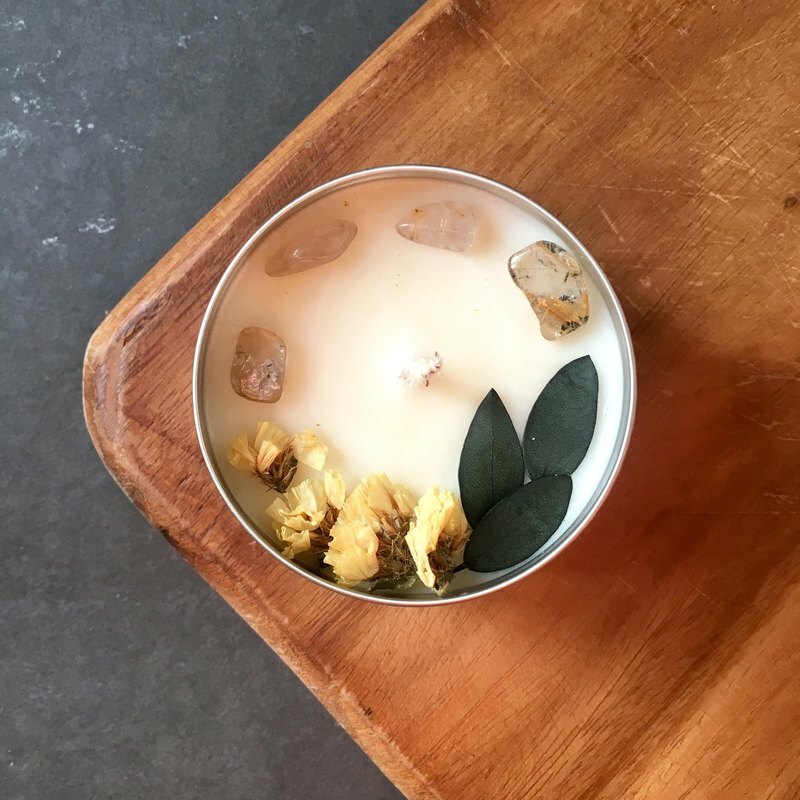 This floral crystal soy wax candle is handmade to order using natural oils and beautifully designed with dried flowers. This floral crystal soy wax candle is handmade to order using natural oils (of your choice) and beautifully designed with dried flowers. It combines the power of healing crystals with aromatherapy to provide a calming environment. Tin containers are used for a rustic vibe paired with minimal design of dried flowers that help to elevate the aroma when the candle is being burned. Light and easy to take around - this candle is perfect for travelling or gifting to loved ones for all occasions including birthdays, weddings, and baby showers! [ FLORAL CRYSTAL CANDLE DETAILS ] Dried Flower: Yellow Forget-Me-Nots and Eucalyptus Leaves Healing Crystals: - Size: 7-9mm (0.27" to 0.35") each - Type: Rose Quartz, Amethyst or Moon Stone (refer below for the different benefits) 100ml (3.5oz): Dimensions: 4.5cm (1.77") in Height Burn Time: Approximately 20 - 25 Hours 350ml (11oz): 7.5cm (2.95") in Height Burn Time: Approximately 50 - 60 Hours Handcrafted in Hong Kong [ CHOICE OF HEALING CRYSTAL] ROSE QUARTZ: Helps to restore trust and harmony in all different kinds of relationships while improving their close connections. It can also help provide comfort and calm during times of grief. This crystal also encourages love, respect, trust and worth within one's self. AMETHYST: This stone is incredibly protective, healing and purifying. It can help to rid the mind of negative thoughts and bring forth humility, sincerity and spiritual wisdom. Sleep is another benefit of this stone as it aids in insomnia relief to understanding dreams. Physically, it can help to boost hormone production, cleanse blood and relieve pain and stress. MOONSTONE: Known for "new beginnings", this stone is said to encourage inner growth and strength. When starting fresh, this stone helps to soothe those uneasy feelings of stress and instability so you're able to move forward successfully. It also helps to promote positive thinking, intuition and inspiration while bringing forth success and good fortune. [ CHOICE OF SCENTS ] BAMBOO: A breezy, clean and delicate scent that is reminiscent of a fresh bamboo grove in nature. It helps to regulate the body, enhances stamina and energy level. CEDARWOOD: A warm, woodsy and balsamic scent that is often used as a calming agent to help alleviate stress and anxiety. It provides a spiritual lift and plays a role in aiding respiratory problems. CLOVE: A warm and pungent scent that helps to relieve stress and aids insomnia and depression. The scent is known to stimulate the brain and provides a boost in energy. EUCALYPTUS RADIATA: A mildly sweet and fresh scent that is known for its revitalizing, purifying and clarifying attributes. Emotionally and energetically, this scent often soothes when one is exhausted and can foster a sense of emotional fortitude. GARDENIA: A bold, sweet floral scent that helps to relieve stress. JASMINE: An exotic floral scent that helps to stimulate the mind and improves mood at the same time. LAVENDER: A fresh floral, herbaceous scent that helps calm stress and anxiety. It can also be used to improve quality of sleep. LEMON: A fresh floral, herbaceous scent that helps calm stress and anxiety. It can also be used to improve quality of sleep. LILY: A heavy floral scent that helps to relieve the symptoms of anxiety and tension. ROSE: A sweet floral scent that is popular for its antidepressant and mood-boosting properties. It is used to soothe the nerves, calm the nervous system and act as a tonic to relieve symptoms of depression. SANDALWOOD: A fragrant yet delicate woody scent that is calming and helps to promote mental clarity. Commonly used for meditation and prayer. CUSTOM BLEND: Any two different scents listed above can be combined together to create a unique blend. This option is ideal for those that have specific aromatherapeutic needs. After selecting this option, write down your choice of two scented oils in the “Comments to Seller” box upon check out. In the event where this option is selected but the choice of scents are not specified, the blend will be decided by La Atelier Co. [ BENEFITS OF SOY WAX CANDLES ] - Made from soybeans, a natural, renewable source grown by local farmers. - Cleaner burning: Non-toxic - Longer lasting: Soy candles last longer than a paraffin candle of the same size as it has a cooler burning temperature. - Better scent: Soy candles burn more slowly, allowing the scent to gradually release - creating a more pleasant atmosphere. [ GENTLE REMINDERS ] When burning the candle for the first time, burn for at least one hour to ensure that the top layer is completely melted. This will ensure that the candle burns all the way down. Please trim the wick every time you burn. If you notice frosting, please do not be alarmed as it's an indicator that it's made from 100% soy wax with no other additives. This will in no way affect the way the candle burns. [ OTHER INFORMATION ] + LOST/STOLEN/DELAYED ORDERS Please verify that your shipping address is correct before placing your order. If the order has been entered with an incorrect address, the buyer is responsible for additional postage required for the item to be resent. If there is any problem with your shipment, please contact your local post office and provide them with the tracking number if you had chosen to register your package. La Atelier Co is not responsible for any stolen packages, lost items or errors made by the Post Office - even if the item was sent as a registered package. + CUSTOM FEES Please note that the buyer is responsible for the payment of any additional customs fees and/or tariffs. + LARGE ORDER FOR EVENTS AND FUNCTIONS Our products make unique and ideal gifts/favors for different events such as baby showers, weddings and other functions. All the products can be customised to include names or other words you wish to include on the packaging. Large orders are welcomed and we are happy to assist! However, as a small business and to keep our materials fresh, we do not keep a lot of raw materials on hand. As such, depending on the size of the order, please allow between 1 to 1.5 months of processing time. Feel free to get in touch for a quotation! + FRAGRANCE OILS High quality natural fragrance oils are used for our wax sachets, wax melts and candles. Our products are made with the recommended amount of fragrance oil by the suppliers. Kindly note that the preference of scent is subjective but we do try our best to provide a wide selection of oils. The strength of the scent also varies depending on the fragrance oil, but most will fill a small room with scent, not a large open area. We use soy wax for all our items which is a natural material that provides many great benefits. However, due to its nature it cannot hold too much fragrance oil. If you are having a hard time smelling the fragrance, simply put the product in a smaller room or shut the door for awhile to re-expose yourself to the scent.